With the new formula, FORCE-PLASTIA, the BIO TANIX EXTREME line smoothens even the most rebellious hair, reduces volume, and eliminates frizz. With the new formula, FORCE-PLASTIA, the BIO TANIX EXTREME line smoothens even the most rebellious hair, reduces volume, and eliminates frizz in just one application without yellowing and without losing the tone of the previously colored hair. The new formula contains essential ingredients for a complete restoration of the smoothing process and for total nutritional safety of the strands. Say goodbye to aggressive and preserving chemicals. 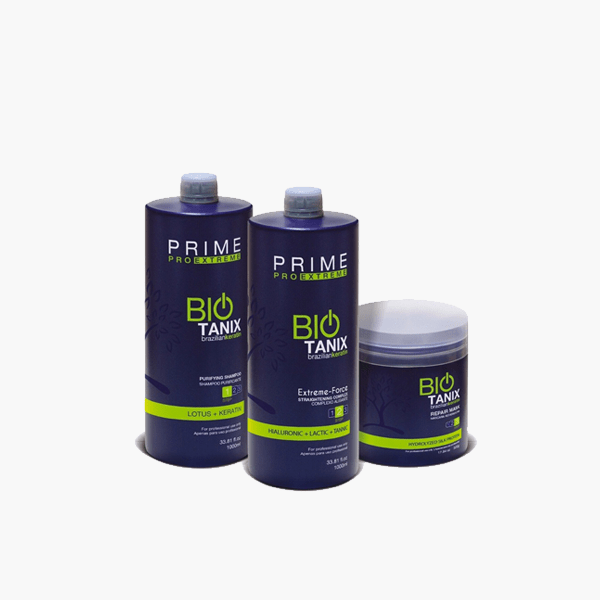 With BIO TANIX EXTREME the hair gains a more natural look, intense shine, stays healthy and free of daily aggressions. Tânico: A Natural composition is extracted from the bark of the Black Wattle Tree (Acacia Negra). Being an environmentally friendly product, it does not lead to health risks. It acts with in the hair shaft releasing Hydrogen and providing an internal imbalance, which results in a smooth effect. Phenolic compound, derived from the secondary metabolism of plants. Lático: Decreases the resistance of the keratin chain, facilitating a new shape to the strand; Sequestering agent, pH regulator and acidifying agent. Hialurônico: Anti-aging action; Fills the cuticle fissures; Form an external coating that helps maintain hydration; Helps preserve the integrity of fibers as well as capillaries; It maintains the hair’s health, keeping it natural, flexible with intense shine. Keratin: It is a three-dimensional fibrous protein, constructed of about 21 amino acids. Its molecular structure contains special characteristics such as: microfilaments with resistance, elasticity, and impermeability to water. Keratin is destined to replenish protein to the strand, lost daily by aggressions such as, solar radiation and pollution. Luna Matrix: Principle a state-of-the-art active ingredient that acts on all phases of the cuticle and cortex, restoring the natural shine and softness of the hair and providing extra protection for future damages caused by chemical or mechanical procedures. Internal and external restoration of hair fiber. Violet 43: In the formula that unites the active principles, the essential oils and the violet and blue pigments result in a treatment that avoids the yellowing of the strands. Flavonoids, which absorb a lot of solar UV radiation, work as a sunscreen, protecting the color and avoiding damage. Reduces volume, and eliminates frizz in just one application without yellowing and without losing the tone of the previously colored hair. Wet hair, apply the Bio Tanix Extreme Shampoo Step1 and evenly massage throughout hair. Apply the Bio Tanix Extreme Smoothing Step 2. After full application, cover with a plastic cap and allow to rest for 45 to 60 minutes. After the rest period, rinse to remove the product at the shampoo sink. Prepare the hair to dry, with the aid of a round brush and leave the hair completely straight. Next, separate into thin layers and flat iron each layer10 to 15 times, depending on the strength of the hair. For blond hair, use the flat iron up to 355°F (180°C) to avoid showing the deep bleaching. To finish, we recommend the use of Bio Tanix Extreme Mask Step 3, let rest for 3 minutes to balance pH and rinse. Finalize and style as desired.